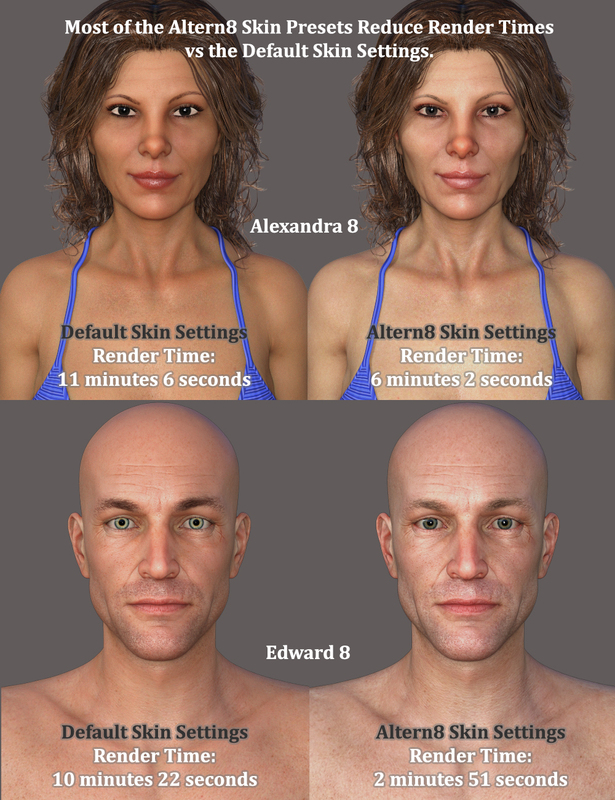 Altern8 - Skin Shader System for Genesis 8 has been moved to Ready to Release by Daz and should be in the store soon. Altern8 is a shader and settings system to help bring added realism (and in many cases, faster render times) to your art. Altern8 - Skin Shader System for Genesis 8 includes 107 Presets, Settings, and Shaders for Genesis 8 figures but can also be used on Genesis 3 figures. 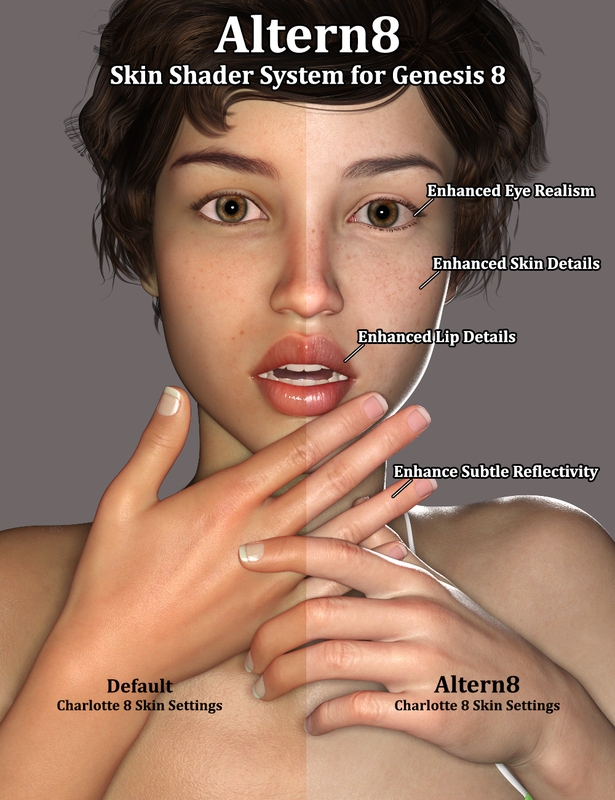 Though Altern8 settings look good in almost any lighting and render set-up, this product also includes 22 Scene Adjustments and Render Settings to help you get the most from your skin textures and Altern8 Skin Shaders and Presets. Now that's what I'm talking bout Diva. You make the most gorgeous skin shaders. So happy to see this coming. Great looking promos Diva! I might have to check this out! This looks wonderful! And I'm so glad it works on darker skins also. Instant buy for me. Looks great, I wonder how it works on characters like Garrett or some FWArt male characters. Would you care to share previews? These look terrific, @DivaMakeup! Looking forward to seeing this in the store. Insta buy for sure! Looks fantastic and love how it looks on the darker skins as well. So excited to see this coming out! I got to test these and they are FANTASTIC! You where an amazing beta tester and your feedback was crazy helpful! Thank you, my friend! I really love the renders you made with Altern8! Brilliant. I'm keeping a tight rein on my spending so that I can buy this! Looks very interesting. Hope it will appear in the store, soon. Will go down a storm in the store. Surely, one more step towards realism. Will there be a G3 variant as well? This! Hurray for Diva! I've been waiting a long time for this. Finally! You shall be richly rewarded for your diligence. But one thing: Why not name it "for Genesis 8 and 3" instead of making us have to later read, "also works on Genesis 3"? Not everyone goes to the product page of new products and READS. If you put it in the name, then people INSTANTLY KNOW. And, since some people have not switched to Genesis 8, they may rule it out at first sight. This could mess wit yo money! Fix it, please. Agreed! The "For G3" is quite important. Definitely a selling point for me! I saw this earlier...really well done. Oh my, now that's simply beautiful. Thank you for the previews! I'll definitely be grabbing this come payday! Does it also come with the lighting used in the promos? This is looking really good - I hope soon comes soon! I like what I see a lot. Faster render times are a real bonus too. Does it require anything above the usual in terms of graphic card capabilty or processor power? Recent Daz skins seem to be making my computer work noticeably harder than it used to with the older ones for some reason. I wantz theze! I wantz! color me waiting for the release down here with the rest of the instabuyers. Thank you! :) Yeah, the product comes with 2 HDRs, 3 scene render settings, and several scene adjustment settings. :) Most of the Promos where done with the included render and scene settings.